I’m sure you’ve heard that everyone–from Gwyneth Paltrow to Nicole Ritchie– has been juicing, and for good reason. Juicing is amazing for your body. For those of us who don’t love the taste of raw vegetables, it provides an easy way to get 4 servings of veggies in one sitting. It is also a great way to allow all the nutrients from raw vegetables go straight to your system while relieving your body of the task of digesting. I’ll definitely be writing more about juicing throughout this blog, but for now I want to give you my recipe for a tasty (even for those who don’t like the taste of green juices) immune boosting, detoxifying juice. This is something I drink whenever I feel low on energy, or when I just feel like I need to get rid of something in my system. 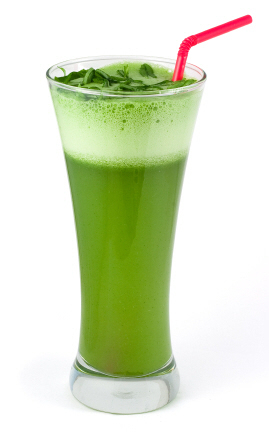 The lemon and apple cuts through the taste, so you won’t even feel like you’re drinking greens! 1 Bunch of Cilantro–Cilantro has amazing benefits! It aids digestion and is reported to act as a natural chelation treatment for the removal of heavy metals. Place all items in a juicer and let it do its magic! For those of you that don’t have a juicer, most juice spots/health stores have these ingredients and will be happy to juice them all together for you! Can also make can juice with a blender.